Assistant Professor of Physical Therapy Dr. Christi Williams spent the summer spreading joy throughout the community with her certified therapy dog, Layla. A 7-year old yellow Labrador Retriever, Layla has been volunteering for the past two years as a certified therapy dog through Pet Partners, a local nonprofit organization. 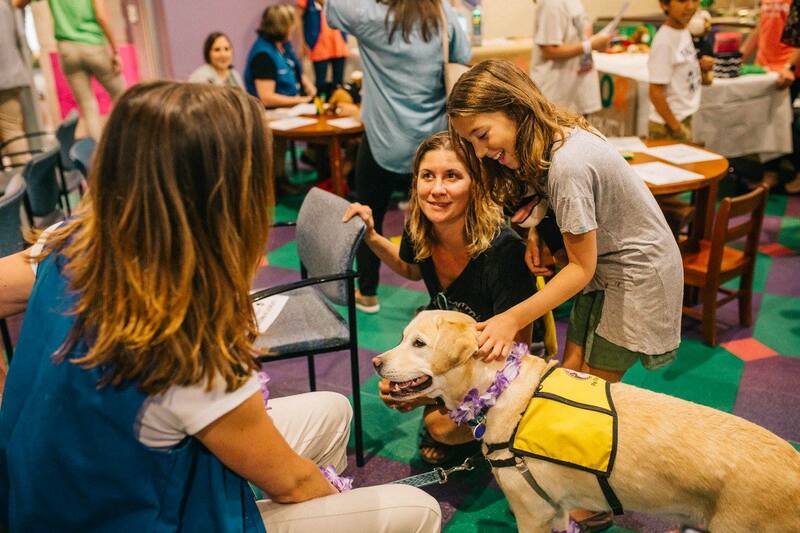 Williams and Layla visit many locations on a volunteer basis, including Vanderbilt Children’s Hospital and Vanderbilt One Hundred Oaks, to spread smiles to patients and health care providers. This summer Layla volunteered with Vanderbilt’s Pediatric Rehabilitation Clinic’s Constraint Camp, a camp that focuses on promoting use of the involved upper extremities by casting the uninvolved side. While there, Layla eased the children’s fears and encouraged them to try new and often challenging tasks. They worked on their gross motor skills alongside Layla by petting and brushing her and finding special stickers inside the zippered pocket of her vest. Gathering stickers from her pocket allowed the children to work on these motor skills, while also proudly displaying proof of the day’s therapist — their favorite yellow lab. Though Layla loves all her time at camp, Williams said one of her highlights is playing fetch with the children and her favorite pink tennis ball. A very challenging task for the kids as it requires skill to grasp, hold and release the ball, they are determined to play alongside Layla. “She is always patiently waiting for them to throw it her way!” Williams said. One of Layla’s many walks throughout the facility. Layla and Williams also spent time this summer at Monroe Carell Jr. Children’s Hospital’s Dog Days of Summer “Paw-ty” where Layla, and other certified therapy dogs, joined children in games, activities and more. Children watched the dogs do tricks on stage and received some takeaways, too — a dog stuffed animal and a paw print stamp of the therapy dogs who participated. Layla then traveled to Camp TALK, a camp for children with speech deficits, where she taught children about therapy animals. The kids practiced talking to and giving commands to Layla including “sit,” “lay down,” “shake hands” and “high five.” Layla also showed off her catch skills and played hide-and-seek with the kids. Visiting with patients and helping children during their rehabilitation is a big part of what Layla does as a certified therapy dog, but she often has the greatest impact on the health care providers who are working alongside their patients. At the Center for Women’s Health, Layla’s “job” is to visit with the nurses and physicians, providing a necessary break during the day. Photos courtesy of Vanderbilt Pediatric Rehabilitation at One Hundred Oaks and Monroe Carell Jr. Children’s Hospital at Vanderbilt.